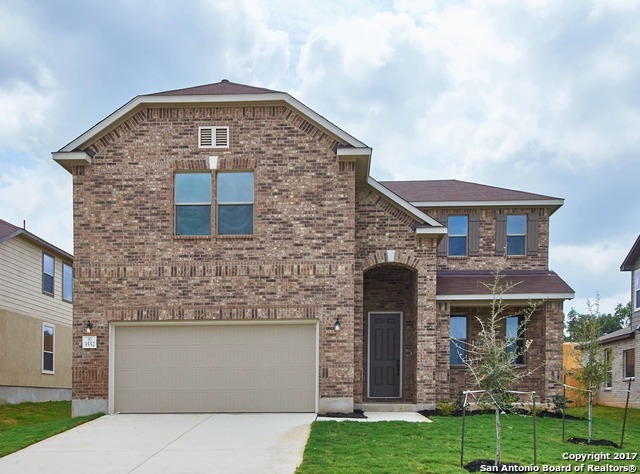 All EDGEBROOK homes currently listed for sale in Bulverde as of 04/18/2019 are shown below. You can change the search criteria at any time by pressing the 'Change Search' button below. "Home features living room conversion to study, crown moulding at living areas & study, Kwikset Halifax lever interior door hardware, 2-in. faux wood blinds, downlight package @ great room & game room, Shaw vinyl plank flooring & entry, great room, kitchen, laundry room & master bath, upgraded Shaw carpet & pad@ bedrooms & game room, gourmet kitchen with gas, Woodmont Cabinetry Dakota Shaker panel kitchen & bath cabinets, upgraded granite kitchen countertops w/ mosaic tile backsplash, Moen Gr"
"Home features formal dining room, master bedroom down, pass through to kitchen, kitchen cabinet crown moulding, Silestone kitchen countertops with glass mosaic tile backsplash, stainless steel Whirlpool glass top range, microwave/hood, 5-cycle dishwasher, 42-in. separate acrylic garden tub & shower w/tile surround, decor marble countertops @ master bath & bath 2, pedestal sink @ powderbath, upgraded Sherwin Williams interior paint, soft water loop, security system, covered patio, & full spri"
"Home features rounded corners, 2-in. faux wood blinds, extended granite kitchen countertops, Moen Arbor high arc kitchen faucet, Whirlpool glass top range, microwave/hood combination, and 5-cycle dishwasher, crown moulding at master bedroom, framed vanity mirror and full shower with tile surround at master bath, raised vanity at master bath and bath 2, and covered patio."